Emirates is encouraging travellers to ask “Where Next” in 2018 with a wide range of special offers to destinations across its global network. 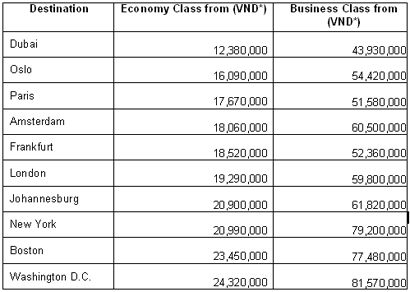 With Economy Class fares starting from VND 12,380,000, and Business Class fares, starting from VND 43,930,000, Emirates offers passengers exciting and affordable options to explore a world that is beyond imagination. All fares are for round-trip tickets, inclusive of tax and fuel surcharges. Pay less, but explore more. From Europe to the Middle East, from the Americas to Africa, Emirates offers inspiring travel options, enabling passengers to fulfil their passion for travel. Fly Emirates and head to its hub, Dubai, as your final destination or as a stopover. Dubai is a cosmopolitan city that offers attractions and activities for everyone. With sprawling amusement parks, thrilling desert dune bashing activity, iconic buildings, stunning beaches, world-class malls, and well-preserved cultural sites, Dubai has your interests covered. From Dubai, you can connect to some of the world’s most popular destinations. Travel to the city of love, Paris, for a romantic escape, or enjoy a gondola ride through the beautiful canals of Venice. Go for an exciting safari adventure in Africa; or explore New York City’s Central Park; or relive memorable movie scenes at Universal Studios in Hollywood. Whatever you want to do, you can rely on Emirates to take you there. Exceeding one’s imagination is not only about discovering the world, but also taking advantage of Emirates’ special fares - valid from December 29, 2017 to January 23, 2018, for travel until November 30, 2018. 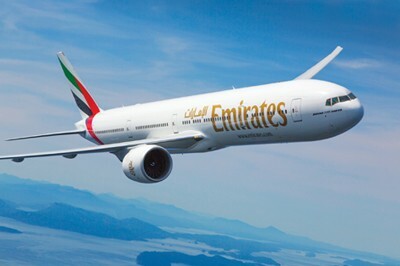 Emirates is the world’s largest international airline, connecting over 150 destinations in 84 countries to - and through - its Dubai hub. Today, Emirates fly the world’s biggest fleet of Airbus A380s and Boeing 777s, offering passengers the comforts of the latest and most efficient wide-body aircraft in the skies.